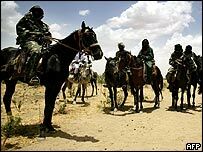 On the last day of their US summit, G8 leaders have called on Sudan to disarm militias in its western Darfur region. Blaming the rebels for massive human rights violations, they urged both sides to respect the ceasefire. The statement came as the G8 leaders and their counterparts from six African countries began talks on issues affecting the African continent. The leaders also agreed to extend a debt reduction scheme for the world's poorest countries for two more years. The initiative for Heavily Indebted Poor Countries, managed by the International Monetary Fund, had been due to finish at the end of 2004. Twenty-three of the 27 countries that have qualified for debt relief under the HIPC initiative are in Africa. Apart from Sudan and debt reduction, Thursday's talks on Sea Island off the coast of Georgia were expected to discuss conditions in Zimbabwe - as well as endorsing new initiatives on Aids, peacekeeping and trade. The G8 statement on Sudan said the group looked to the United Nations to lead the international effort to avert "a major disaster" in Darfur - described as one of the world's worst humanitarian crises. "There are continuing reports of gross violations of human rights, many with an ethnic dimension," the statement said. Middle East - Israel / Palestinian conflict and looming Iraq handover are key issues. Bush unveils 'Broader Middle East Initiative'. Oil prices - Financial markets jittery over fears of new terror attacks and possible disruptions of supply. Debt relief - Leaders expected to vote to extend debt relief for world's poorest nations. Global economy - Talks on the state of world economy amid growing recovery after three years of relatively weak performance. International trade - Discussions on WTO negotiations to remove barriers to international commerce. "We call on all parties to the conflict to immediately and fully respect the ceasefire, allow unimpeded humanitarian access to all those in need, and create the conditions for the displaced to return safely to their homes." "We call especially on the Sudanese government to disarm immediately the Janjaweed and other armed groups which are responsible for massive human rights violations in Darfur," said the statement. In a separate development, the European Union announced a 12-million euro package ($14.5m) to "support the rapid deployment and operations of an African Union-led observer mission that will monitor the implementation of the recent ceasefire agreement in Darfur". EU development commissioner Poul Nielson said in a statement that the money showed the EU was "a credible partner" for the African Union in its efforts to solve the crisis. "We believe that the success of this mission is crucial," said EU spokesman Jean Charles Ellerman-Kingombe. "It is very much needed at this time in Darfur." Africa remains the only part of the developing world no better off than it was 25 years ago. This is despite many initiatives in past decades - from the Brandt Commission and Live Aid in the 1980s to more recent efforts such as Washington's Aids fund and Africa's own Nepad partnership. Growth rates and life expectancy are falling and poverty is growing amid the Aids epidemic and continuing war, corruption and bad governance. How much progress has been made on debt relief? Per capita income in sub-Saharan Africa is now estimated to be $200 lower than in 1974. The G8 leaders are expected to look at plans to train and equip more than 50,000 peacekeepers over the next five years, particularly for deployment in Africa. US officials said the initiative had grown out of African requests for assistance in ending the civil wars plaguing the continent. The G8 summit is taking place on a heavily protected island, far out of reach of protests by anti-globalists and other protesters. The BBC's Rob Watson notes that security is so tight that even the army of correspondents covering the talks has been kept 90 miles (144km) away. "Death is everywhere here. There are eleven graveyards in this camp"
2015: Where will we be?